An anklet is the most beautiful accessory which has the perfect blend of tradition and rebellion in it. It is worn around both the ankles but now, the fashionistas like to keep it different. Instead of wearing it over both the ankles, they like to wear it only in one. This piece of jewelry originated in Asia which was worn by the married women to reflect happiness and prosperity. But now, people all over the world like to wear it as a fashion accessory to enhance the beauty of their ankle. Married and unmarried both wear anklets in gold, silver and many other metals. Now a days, the sterling silver anklets have been gaining a lot of popularity and being worn as an accessory in all the occasions. The contemporary anklets are made by using a lot of more materials that includes pearls, glass, gemstones, beads and a lot more. An anklet can be worn over all the outfits as it has the most ideal blend of contemporary and classic look. From the short dress to the full gown, skirts to jeans, sarees to suits; the ankle bracelets look stunning each time you wear them. Tough the traditional anklets can be worn by only a special class of people, the designer ones can be worn by all the age groups due to the wide choices, collection and patterns. The anklets made with Swarovski or freshwater pearls look elegant can be worn by any age women. 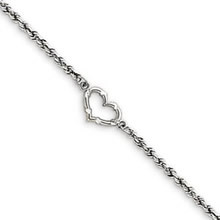 A sterling silver anklet is a perfect gift if you wish to give something really nice to someone who is very close to you. These anklets come in adjustable chain which can be fixed according to the person’s ankle size. Unlike the other type of jewelry, the sterling silver anklets are easier to choose and comes within budget. The simple and cute designs are ought to impress anyone wearing it. 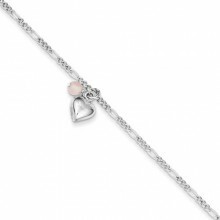 Thus, you can be assured to make the person love it whom you gift the stunning piece of anklet. The anklets come in many designs which makes it easier to choose your design according to your personal taste and style. 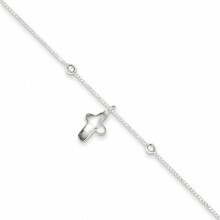 For instance, for an elegant and simple look, you can opt to wear a box chain cross anklet in sterling silver. But, if you show some fun side, then you can choose to wear a fancy cross anklet in sterling silver. This looks hep and cool too. Thus, you have adequate options to choose from which you can wear according to the event, mood and occasion. iBraggiotti has a wide collection of anklets which can be worn in any occasion. These look elegant and sophisticated enhancing your overall look and class. You may even checkout other jewlery offered by iBraggiotti.com for more and better options offered at the minimum cost. The range of ladies wedding bands and eternal bands are simply awesome that comes without digging a hole in your pocket. Thus, checkout now for more options.